On this week’s Curmudgeon’s Corner, Sam and Ivan go all “Lightning Round”. They cover a wide variety of topics, including: State polls for 2020, talking policy vs talking scandal, the linked government shutdown and immigration debates, the Space X Falcon Heavy launch, Twitter’s release of Russia data, Ivan’s problems with his door, Rob Porter’s resignation, the aftermath of releasing “the memo”, welcoming a new patron, and much much more. 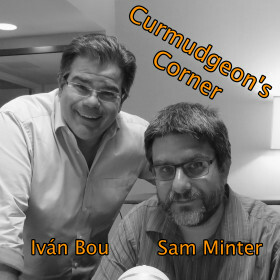 This week on Curmudgeon’s Corner, Sam and Ivan talk about a number of developments in the Trump-Russia world, including Trump’s attempt to fire Mueller last year, the Dutch hacking the Russians, McCabe’s retirement, Trump not agreeing to an interview, Gates possibly flipping, and more. Then on the eve of Release The Memo Day, a discussion of the expectations for the memo, the objections being raised, and the possible implications. Oh, and it is Ivan’s birthday. Happy birthday Ivan! Who is the audience, what are the goals? The week on Curmudgeon’s Corner, Sam and Ivan talk about Ivan’s evacuation from Florida in anticipation of Hurricane Irma, more general thoughts on Hurricane Irma as it approaches Florida, Trump’s recent moves that are making Congressional Republicans upset, Information Warfare in the age of Facebook and Twitter, and finally the Equifax data breach. On Curmudgeon’s Corner this week guest cohost Ed joins Sam to discuss Hurricane Harvey, the pardon of Sheriff Joe, Schneiderman teaming up with Mueller, gerrymandering, and partisan sorting as their bigger topics. But they also touch on Sam wearing a suit for the first time in over a decade, the speakers at the event he went to, and the possibility of just paying Democrats to move to red states. On Curmudgeon’s Corner this week, Sam and Ivan dive into the latest developments in the Trumpcare saga, the revelation of the second Trump/Putin meeting, and Trump’s revealing interview with the New York Times. Rounding out the show, shorter discussions of wearing different sorts of glasses, John McCain’s diagnosis, odd happenings in Florida, and some factoids from Wiki of the Day. Why aren’t more people quitting? This week on Curmudgeon’s Corner, Sam and Ivan focus on the “nothingburger” of the Donald Trump Jr meeting everybody has been talking about. Nothing to see there, right? But before that, they do manage to get in some conversation on Trump’s performance at the G20, and on completely non-Trump matters, they talk about unlimited data plans, kids and YouTube, and revisit the minimum wage. Lots of meat in that nothingburger! How much more is there?